On February 17th, Dr. Mitchell announced the 2015-2016 6.3 million dollar budget cut at a press interview. Not only are they cutting around 6.3 million dollars they will be also letting go around 102 staff members from the Instructional Support Program. The Instructional Support Program is a program where literacy and math coaches support teachers and help students who are struggling with math and literacy skills. I got the chance to meet with Dr. Mitchell and discuss the matter at hand from a student’s perspective. 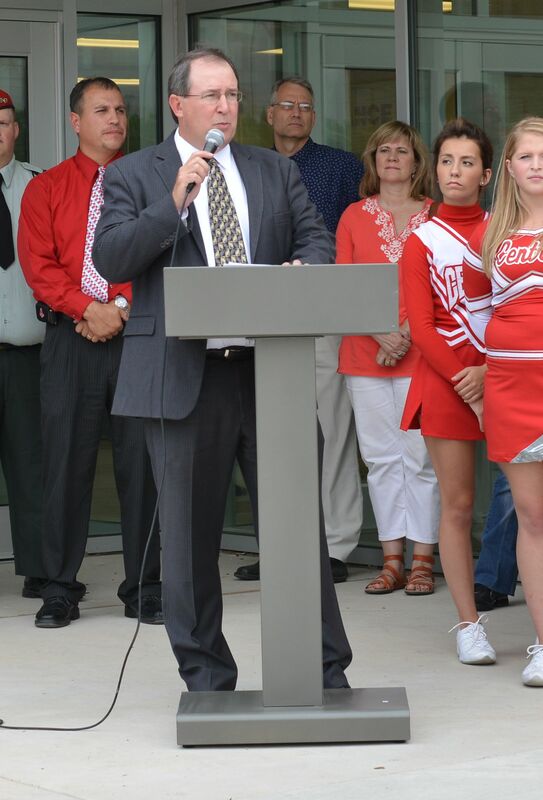 Dr. Mitchell speaks at the ribbon cutting ceremony for Central’s renovations. Photo by Debi Allen. Madison Lampert: By cutting 102 staff members from the ISP programs, who do you think would be affected the most: elementary, middle, or high school level? Dr. Mitchell: About 102 staff members will be broken up and taken from each school, but the greatest impact is going to be on the elementary students and teachers. I am meeting with all the principals to find how we can build back the support for students and teachers that are struggling with mathematics and literacy and how we can find a way to keep that support without using as much staff. ML: While eliminating around 100 staff members how do you plan on providing that support to students and teachers? ML: How are our test rankings across the state with the support program, versus other schools that have less support, and how do you think they will affect us when we eliminate 100 staff members? Dr. M: We took a test last year that didn’t give us any results and we are going to take a test this year that hopefully will give us results, but usually 70% of our students that are tested in grades 3-8 and 11th are advanced and proficient in either reading or math, and that has stayed level the past five years. That is somewhat below the state average, but years ago those numbers where a lot lower, so we are trying to have better math and literacy programs. I am a little worried that getting rid of about 100 staff members, that our numbers are going to drop, but you’re always little nervous when you change things, but we are gonna try and put together the best system we can with the money and support that we have. Other schools across the state have less support and better test scores, so we are looking into how we can fix our support and raise our test scores. ML: With the 6.3 million dollar budget cuts what types of things will you be cutting? Dr. M: There is a ton of things on the list such as custodial, maintenance, extra curricular programing such as travel and supplies. We have talked about eliminating positions that we haven’t filled in a long time. We are looking at our warehouse and managing our printing. We have talked about getting rid of printers or going paperless. Also encouraging teachers to do more online things with their students. You won’t see any extra curricular program being “cut,” just things within the each program like traveling and uniforms. ML: What is the point of the 6.3 million dollar budget cut? Dr. M: The whole point is to get rid of a 6.3 million dollar deficit in our spending budgets, but everything we have been doing is to eventually raise teachers’ salary. It takes a very dedicated person to be a teacher. They do off the clock work all the time and don’t get recognized for it. They work very hard and they don’t get the respect they deserve in the community sometimes, but they are very highly trained professional people that have a real moral imperative, that they want to help people be successful in life.Teachers put in a lot of time to help people succeed, and RCAS teachers are no different!